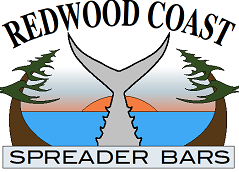 Redwood Coast Spreader Bars (RCSB) operates out of Humboldt County, California. We might be a new company, but our products reflect decades of experience building and using spreader bars and dredges. Our products are custom made in small batches. Once one batch is sold out, the next batch may have subtle (or significant) differences. Check back often for new colors, new squids, and new products. We will stock the most popular items and will always honor special requests. Let us know how we can help! We specialize in custom made composite spreader bars. The 'Finney' centerpiece paddles on our spreader bars are custom made by leading edge spreader bar manufacturer Capt Bob (RnR Bob) Melville. The 'Finney' paddles help keep the bar above the surface, create a splash, and help the bars come to the surface quicker if they do go sub-surface. Our materials are the best out there and you wont find anything else like them. They are unique, yet very practical and angler friendly. Not too wide... not too long... these bars are a lot easier to use than most others out there. We stand behind our products and will replace anything resulting from poor worksmanship (not including angler error!). If you shop around you might notice our prices are the same, or better than the big name dealers. In fact, our dredges are $25 less than the big name ones (not to mention they will catch more fish). All of our products are assembled with high quality materials, like Jinkai line, sleeves, ring/grommets, ball bearing swivels, etc. Troll at any speed within reason (less than 12 knots!). Position them on the top of the wake- adjust the distance behind the boat as conditions and boat speed change. Make sure to position them so that they run above the water, skimming and splashing occassionally on the 2nd or 3rd wakes. We recomend using your favorite lures as your chasebaits. Put them about 2-4 feet behind the spreader bar. If using a cedar plug, make sure to add a good swivel to your leader and position it 3-4 feet behind the spreader bar. It is important to keep in mind the value a spreader bar adds to your spread. 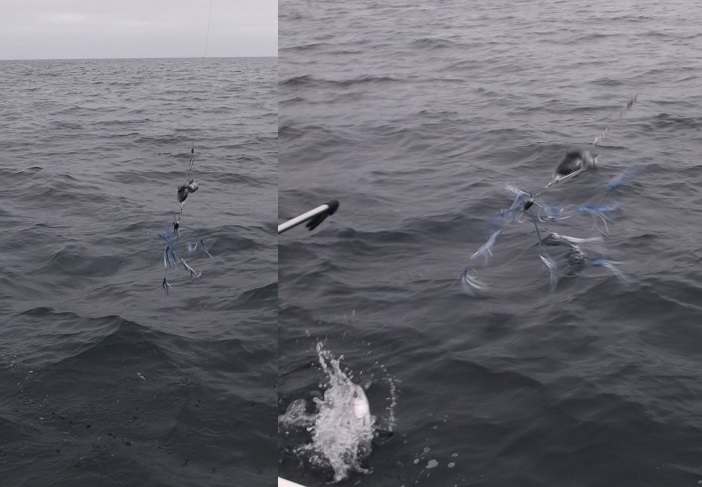 Not only do spreader bars create a more natural illusion (with a fleeing school of prey, like you'd expect to see in nature), they also create more surface commotion to help attract fish to your wake. 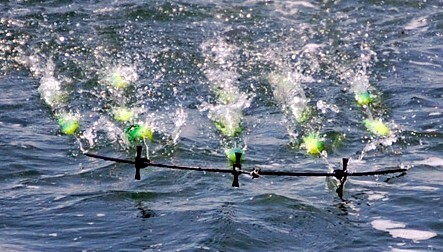 Resist the urge to take your spreader bars out of the water when they are not getting hit! Some days the bars might be quiet, but they are helping attract fish. Other days, they will be on fire and your buddy boaters will wonder why your having such good luck! Keep a bar in the water! Fish your dredge behind a downrigger or attach it directly to a sinker release, planer, or Deep-6. Anglers have most confidence in their favorite lures... use them! Put your favorite lure (or bait) 2-3 feet behind the dredge. Lures or baits that have action like spoons, rotating bait holders [like Bechold, rotary salmon killer (RSK), franko bullet rotator (FBR), etc] will work better than a straight hoochie. Dredges are proven to be effective for salmon and RCSB dredges have caught all species of Pacific salmon. There are several options available for using dredges with a planer. Here are the most popular options. Option 2: Use a short leader in between the planer and the dredge. Rinse thoroughly with fresh water after your trip. Hang the bar in your garage or other area where it can hang dry. Copyright © Redwood Coast Spreader Bars. All Rights Reserved.